Read on to learn how to maintain shoulder mobility ans scapular stability. < Previous postThe Primal Blueprint Cookbook Now Shipping! This is the one I’ve been waiting for. Been dealing with shoulder problems off and on for years. I’m really looking forward to tomorrow’s post, so I can learn how to help it. Thanks Mark! Me too! I just started my physical therapy on Monday for my shoulder. Turns out I had more issues that I thought when it first started hurting back in February. I thought I had just slept funny – well 2 1/2 months later, I’m finally getting it back to where it needs to be so in a few weeks, I can start lifting again! Really want to hear what you have to say about how to maintain scapular stability. While I love pushups and pullups, just looking at our bodies makes clear that they were not the primary goal of the arms. 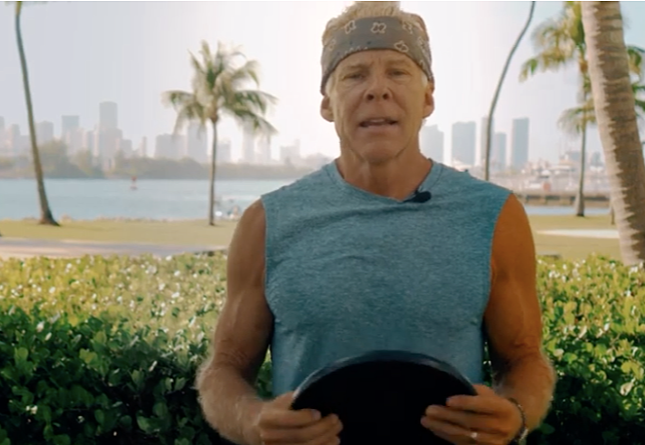 I’ve been worried about pushing too hard on these exercises, so I’m really enthused that you’re going to explain all about protecting the shoulder. Same here. I do push-ups and pull-ups everytime I lift heavy things… that includes today! I never want to overdo while I want to be as strong as possible – ya need healthy shoulders to be doing it effectively! You brought up a good point. Many parts of the body aren’t “designed” to do what many of us do in modern times or in gyms. But we do them anyway and for the most part they adapt pretty well. But you hit it on the head when you implied a concern with pushing too hard. Pushing too hard with either maximum load, velocity, or volume increases the probability of technical degradation, which is when the shoulder girdle is most at risk. I believe this is drawback to the general use of the CrossFit method where an inexperienced, quasi-experienced, or even highly experienced participant pushes him- or herself to beyond “acceptable” degradation of technique. Do this often enough and the trauma rate exceeds the recovery rate, and evolutionary design makes its point clearly with a blown shoulder. General advice, for what it’s worth: Be smart, be familiar with technique, know “how much” you can deviate from this technique, and finally know when to stop the set. My $0.02 and keep the change. Great one again, Mark. I really like this recent series of articles. Very informative and the stuff you don’t often hear about. This one’s off topic (and if it’s out of bounds, please don’t take it personally), but would you share your thoughts on Floyd Landis’ recent admission that he was guilty of doping? No need to comment on the specifics of the allegations (unless you want to) particularly as they relate to Lance and other third parties. I’m mostly interested to hear your perspective on it as a former elite athlete and one who’s taken a leading role against drugs in sport. What do you think about the process? How can (or maybe just “can”) sports and the testing regimes be reformed? What’s do you think is the next step for Floyd both as far as cycling authorities and legal authorities here and in France are concerned? Again if this is too off topic, or if you’d rather just not “go there” in light of the very preliminary, (and, IMO less than totally credible) allegations, no offense. Apologies in advance if this was the wrong place to raise this issue. My husband has been dealing with Adhesive capsulitis (frozen shoulder) in both of his shoulders for almost a year now. He’s going in today for the ortho to do a manual manipulation under anesthesia. He is young to have this problem, only 38, the Doc says this is usually seen in men and women in their 50’s. But, my husband is also diabetic which seems to play some roll in it but we’re not sure what. I really hope this is the answer, he’s not been able to do any upper body workouts because of the loss of mobility and pain and has to take Advil PM at night to sleep. Do you know anything about this issue Mark? If so please share. Very timely post for me. I am seeing a physio on Monday to look at a nagging shoulder injury I have had for about a year. At least I will now have a better understanding of what I am letting myself in for! I just have to share how I accidentally cured my shoulder problem. I had tried everything: chiropractor, PT, OT, acupuncture, NSAIDS… the works. I’d had the pain for over a year. Then one day, I had to spray for some weeds. I have a 2 gallon sprayer that when full weighs about 16 lbs. I carried that with the “bad” shoulder, with it’s slowly decreasing weight for 45 minutes of spraying. My shoulder was really burning when I finished. The next day I woke up with all my shoulder pain gone. 100% gone. I guess the traction and holding the weight of the sprayer slightly away from my legs to keep it from bumping against me did the trick! and it hasn’t returned at all? so happy for you, wow. i get a popping sound in my right hip on the down movement of a sit-up! same thing. it doesn’t hurt but i really don’t think that it could possibly be good for me. i get popping in my right hip too! and i, a mere 29! Mark, thank you! I have messed up my right shoulder twice now and have sort of become gun shy with weights. I stopped wide angle pull ups and military press because my rhomboid section closest to my spine locks up and twitches. I have been doing a bunch more power yoga to try to losen it, but even that hurts sometimes. 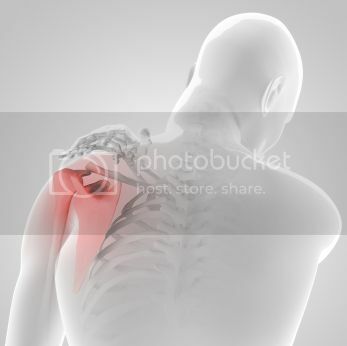 I can’t figure out if it’s my AC joint or rotator cuff that clicks. Do you have any suggestions as to what exercises I could do to help losen it up? I have a calcification in a ligament that can’t be corrected via surgical means. Stopping dumbbell flys has kept it somewhat under control, but when it flares up it is 6 weeks of heavy ibuprofen and therapy and no lifting. Some really new stuff (at least for me) here. I wouldn’t imagine scapulas where that important (just like one year ago I wouldn’t imagine carbs where so bad), so I’ll trust you on this one too. Looking forward to part too. I swim laps for exercise and couldn’t swim for almost a year when I developed a shoulder impingement. PT finally cured it, but it was a long, slow process, and I had to keep up the exercises until the shoulder was finally pain free and strong. I now do the PT program periodically to keep my shoulders strong. I have a shoulder impingement caused by an ice-skating fall. Could you post a link to the PT program that finally cured it. I keep telling my doctor that my shoulder is killing me and he just says, “Oh, oh. Well, exercise.” My five-year old can now throw a ball farther than I can. Actually, push-ups are a great exercise to stabilize the scapulae by strengthening the serratus anterior. After 10 years in the industry, I’ve come to the realization that unless you desire to be a competitive powerlifter, the bench press is a utterly useless exercise that only serves to feed some adolescent fantasy. Push-ups are superior in just about every aspect, and can be loaded in a variety of ways. I’m going to be more cognizant of retracting my scapula during squats, bench presses, and pull ups in the future after reading this. Thanks for a great post Mark. I have been enjoyed this whole series of posts on our different body parts. Very helpful! Thanks for a fantastic explanation of the shoulder joint and it’s inherent blessings / curses. I wonder how much of our shoulder problems can be traced to improper exercise form and or too much testosterone? How would too much testosterone affect shoulder health? After injuring my shoulder in yoga many years ago, I found Pilates exercises regarding scapular stabilization to be simple but effective. More than anything the movement work on the mat as well as on the Reformer and other typical Pilates equipment heightens awareness regarding what each individual’s range is, and how to articulate it with ease. But again, that’s been my experience with investigating what works best for me. Hmm.. I really should do perform more shoulder dislocations. Great post Mark especially considering so that many of us are spending more and more in seated flexed-forward positions. We need to loosen up the pecs, strengthen the upper back, and keep our shoulder girdle in good health each day! Great article. 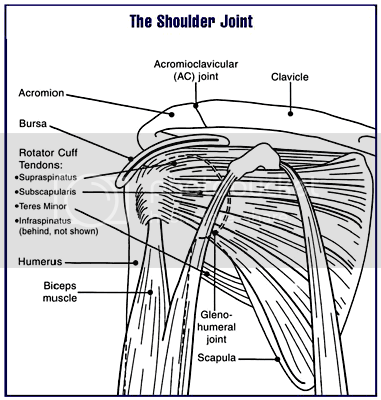 However, regarding the shoulder joint having 10 articulations, I think you mean movements of the shoulder. In anatomy, articulation refers to the actual joint which joins two bones together. There are only 3 articulations in the shoulder: The acromion of the scapula articluates with the clavical to form the acromioclavicular joint, the clavicle articulates with the manubriam of the sternum to form the sternoclavicular join, and the glenoid fossa of the scapula acticulates with the humerus to form the glenohumeral (shoulder) joint. There are 11 movements of the shoulder: arm flexion, arm extention, arm adduction, arm abduction, medial rotation of the arm, external rotation of the arm, circumduction of the arm, and scapular elevation, depression, retrataction and protraction. Don’t forget about the scapulothoracic articulation, making a total of four. This post couldn’t come in a more timely fashion…. I have been dealing with shoulder problems for going on 8-9 months. I tore my supraspinatus tendon I am not sure how I did it, but one day I went Crossfit and I couldn’t even bench. I have basically been forced to get cortizone injections to see if it will heal before they opt for surgery. I am 23 years old I never thought I could have so many muscloskeletal issues. Any thoughts or input on this situaion would be awesome! I am a big row machine fan. I do 3-5 sets of sprints with good posture to warm up lots of times at the gym. Quite enjoyable. Great article. I listened to my coaches in High School and completely tore apart my right shoulder. I tore all but one of the rotator muscles and had a posterior dislocation of the shoulder which onyl accounts for about 5% of all dislocations. these are the ones that the only way you know it’s out is if your arm goes numb. Not great when you play third base or are the QB. I had to have the entire thing rebuilt and it took 4 years of rehab to get it back. Needless to say I take very good care of the shoulders now. It always flies over my head how it is recommended to contract your shoulder blades together when doing bench presses or rows. I can understand do that when your arms are retracted. But how is that even possible when your arms are extended?? I’ve stopped bench pressing due to shoulder issues…thanks for the article!